Cherry Blossom Festival, Anderson Conference Center, Colonial Mall of Macon, Eisenhower Crossing Malls, Macon State College, Am Star Theatre, Lake Tobesotkee, Walmart, Samsclub, Mercer University, Georgia Music Hall Of Fame, Georgia Sports Hall of Fame, Macon Centerplex and City Auditorium, The Hay House, Tubaman Museum, Middle Gerogia Airport, Cannonball House, Robins Air Force Base, . Book your room at our Pet Friendly Super 8 Macon West hotel near Middle Georgia State College. Located just off Interstate 475 about 15 minutes west of downtown Macon — and close to Anderson Conference Center, Mercer University and the annual Cherry Blossom Festival — offer comfortable accommodations at an affordable rate in middle Georgia. Each of our rooms feature dependable amenities like a microwave, refrigerator and free Wi-Fi Internet access so you can keep in touch with family and friends back home. Book a two room Jacuzzi suite for additional comfort and space. Kids 17 and under stay free with an adult, and we offer handicapped-accessible rooms and facilities. After a restful night of sleep, start each day with SuperStart continental breakfast with fresh hot waffles, sausage biscuits and cinnamon rolls. You won't have to go far from our Macon, GA, hotel to find fun things to do. For last minute items, shop at nearby Eisenhower Crossing or Macon Mall, both just 3 miles away, and then take in Georgia history Georgia Music Hall of Fame and Georgia Sports Hall of Fame. See downtown attractions like the Hay House, Tubman Museum, and the Cannonball House or get out of the city for a relaxing day on the water at Lake Tobesofkee, just 2 miles from our hotel. Fort Valley State University and Central Georgia Technical College are just minutes away. Just outside our Macon, GA, hotel are a number of restaurants to choose from, including Shanenshah Cuisine of India and J L's Open Pit Bar-B-Q for open-pit cooking. For more ribs and brisket baskets, head to Sonny's Real Pit Bar-B-Q or Dine on Mexican food at Magaritas Mexican Grill — both just a mile away at Eisenhower Crossing. Our hotel in Macon, Georgia, offers a business center, as well as copy and fax services. The Super 8 highlights above are subject to change without notice. The graph above is fluctuations of room rates for both group rates and the lowest online individual prices our rate checker could find at the time the group offer was placed. The lowest group/meeting rate displayed is 9.1% in the month of April 2019 and the highest average individual rate is $54 in the month of September 2019. This chart will show past seasonality and also project future months. 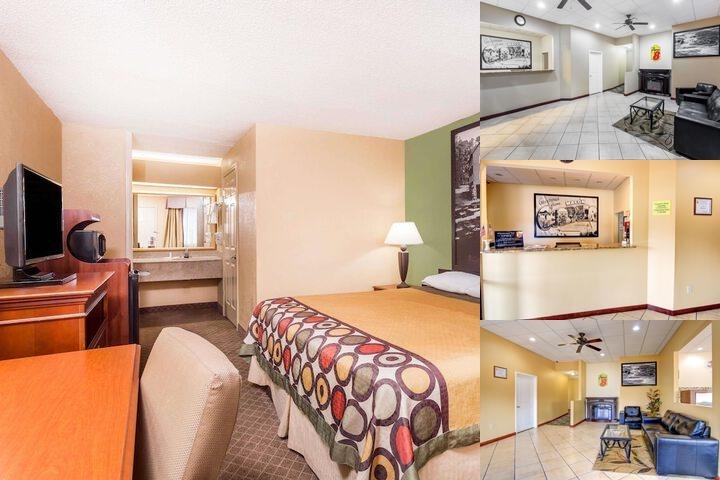 If you are flexible with dates, you may want to consider staying at Super 8 by Wyndham Macon West in a month when rates are lower.